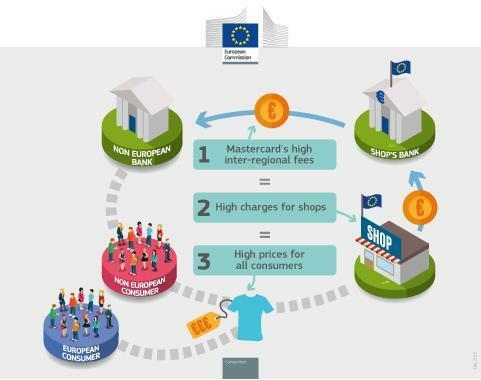 The European Commission sent on 9 July a Statement of Objections to MasterCard. 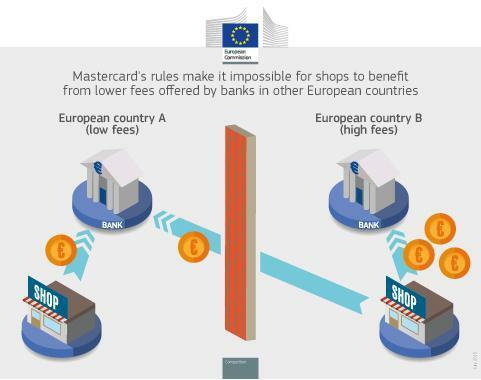 The Statement of Objections outlines the Commission's preliminary view that MasterCard's rules prevent banks from offering lower interchange fees to retailers based in another Member State of the European Economic Area (EEA), where interchange fees may be higher. As a result, the Commission says retailers cannot benefit from lower fees elsewhere and competition between banks cross-border may be restricted, in breach of European antitrust rules. The Statement of Objections also alleges that MasterCard's interchange fees for transactions in the EU using MasterCard cards issued in other regions of the world breach European antitrust rules by setting an artificially high minimum price for processing these transactions. The sending of a Statement of Objections does not prejudge the outcome of the investigation. Payments by card play a key role in the Single Market, both for domestic purchases and for purchases across borders or over the internet. European consumers and businesses are making more than 40% of their non-cash payments per year through payment cards. Every time a consumer uses a payment card in a shop or online, the bank of the retailer (the 'acquiring bank') pays a fee called an 'interchange fee' to the card holder's bank (the 'issuing bank'). The acquiring bank passes the interchange fee on to the retailer who includes it, like any other cost, in the final price he charges consumers for his products or services. Interchange fees are thus passed on to all consumers, even to those who do not use cards but pay in cash. Banks use MasterCard to set on their behalf the interchange fees that apply between them. The Commission takes the preliminary view that MasterCard and its licensees (who issue MasterCard branded cards to cardholders or acquire transactions with those cards for retailers) form an association of undertakings. It also takes the preliminary view that the practices outlined in the Statement of Objections violate EU and EEA rules that prohibit cartels and other anticompetitive business practices (Article 101 of the Treaty on the Functioning of the European Union and Article 53 of the EEA Agreement). Interchange fees still vary considerably from a Member State to another. MasterCard's rules prevent retailers in a high-interchange fee country from benefiting from lower interchange fees offered by an acquiring bank located in another Member State (so called "cross-border acquiring"). The Commission is concerned that MasterCard's rules on cross-border acquiring limit banks' possibilities to compete cross-border on price for services to receive card payments and so restrict competition in breach of EU antitrust rules, leading to higher prices for retailers and consumers alike. A second concern of the Commission is that the high levels of MasterCard's "inter-regional interchange fees" are not justified. These fees are paid by an acquiring bank for transactions made in the EU with MasterCard cards issued in other regions of the world. For example, the fees paid by an acquiring bank when a Chinese tourist uses his card to pay his restaurant bill in Brussels are up to five times higher than those paid when a consumer uses a card issued in Europe. As these inter-regional fees represent hundreds of millions of euros each year, the Commission is concerned that these high inter-regional fees increase prices for retailers and may in turn lead to higher prices for products and services for all consumers, and not only those using cards issued outside the EU or paying with cards. If the Commission's preliminary view is confirmed, it can impose a fine on MasterCard. A Statement of Objections is a formal step in Commission antitrust investigations in which the Commission informs the parties in writing of the objections raised against them. The addressee of a Statement of Objections can reply in writing and may also request an oral hearing to present its comments on the case. The Commission may then take a decision on whether the conduct addressed in a Statement of Objections is compatible or not with European antitrust rules. In December 2007, the Commission found that MasterCard's interchange fees on cross-border transactions in the EEA (e.g. when a Belgian citizen uses his card to pay in a shop in France) restrict competition between banks. In September 2014, the Commission's findings in the decision were confirmed by the Court of Justice. In 2009, to comply with the Commission's decision, MasterCard capped the (intra-EEA) cross-border interchange fees applied by its member banks to 0.20% for debit cards and 0.30% for credit cards, but they did not reduce their other interchange fees. In December 2010 and February 2014 respectively, the Commission also adopted decisions making legally binding commitments offered by Visa Europe (an association of banks) to cap at the same levels (0.20% and 0.30%) the interchange fees set in the EEA for debit cards and credit cards. Most transactions in the EEA are domestic transactions (i.e. when a consumer uses his card in his own country), and were not covered by the Commission's proceedings. The interchange fees on these transactions show wide variations between countries. They have been challenged by national competition authorities and ultimately lowered in several countries. In April 2015 the EU's Council of Ministers and the European Parliament adopted the Interchange Fee Regulation, which from December 2015 on will cap interchange fees for cards issued and used in Europe (maximum of 0.20% for debit cards and 0.30% for credit cards). The Interchange Fee Regulation will lead to lower costs for European retailers and establish a level playing field for the card payment market as a whole. However, the caps of the Regulation do not apply to inter-regional transactions, one of the two issues of the current investigation. An investigation into Visa Inc.'s (which is a separate legal entity to Visa Europe) inter-regional interchange fees is currently ongoing.